Ready to cook ham about 8-lbs. Remove the netting and packaging from your ham. 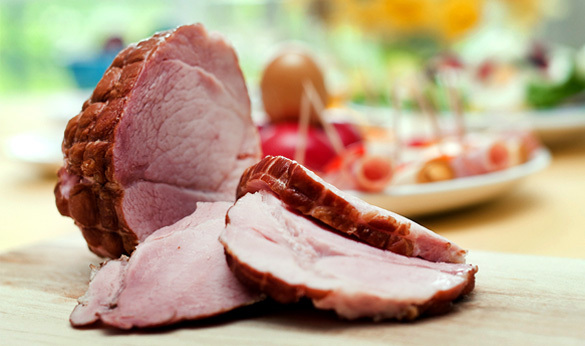 Place the ham in a foil covered roasting pan, with or without a rack. Cut diagonally through the fat but not into the meat of the ham. Cut again in the opposite direction, creating a diamond shaped pattern. In a very small bowl or glass, combine the thyme and melted butter. Set aside. Add the vinegar to a small sauce pan over high heat. Reduce the vinegar until there is only about a tablespoon of liquid left. Add the butter-thyme mixture, honey, brown sugar, and spicy mustard to the pan, whisking well. Take the sauce off of the heat. Using a natural bristle brush or silicone brush, slather 2/3 of the basting sauce on the ham, taking extra care to get it in between the cuts. Cooking times vary depending on the size of your ham. My ham was about 8 lbs. and reached the correct internal temperature of 160 degrees in 3-1/2 hours. Half way through the baking process, baste the ham with the remaining sauce. If the top of the ham is getting brown too quickly, cover it in an aluminum foil tent. Once the ham reaches the internal temperature of 160 degrees F, remove it from the oven and let it rest at least 10 minutes before carving.